Most foreign visitors to Tbilisi arrive by air. Most flag carriers and major airlines use the city's modern international airport, which is only 17 km from the city centre, although Wizz Air and a few other airlines fly in to Kutaisi airport, some 230 km from Tbilisi. Nevertheless, the Georgian capital is now more accessible from western Europe than ever. Tbilisi International airport is about 17,5 kilometres East of Tbilisi centre. The main terminal was built in 2007 and provides good passenger services. There are number of bars, restaurants, travel agencies, ATMs, currency exchanges, VIP and CIP zones. International and domestic (Mestia) flights operate from here. The queues at passport control are usually short and the baggage delivery is often prompt. Getting to town If you rent a car at the airport, the route is well signposted until you enter the city, after that signage is more rare. Follow by signs Rustaveli Av. or Freedom square if you want to reach the centre. If you get lost, ask a taxi driver if you can pay to follow him to your destination. Taxis are relatively cheap and it will be the quickest and least stressful option. The cheapest way to get to the city centre is to take bus # 37 to Freedom square and Rustaveli Av. and back to the airport. The journey takes about 30 - 40 minutes. The bus stop is just in front of the arrival hall and they run every 20-30 minutes. Only coins are accepted and a single ticket costs 0.50 Lari. You can change notes into coins at the tourist information located in arrival hall. These buses operate from 07:00 until 22:00, which is not very helpful if you flight is one of the many that land during the night. A new train station is located only two minutes walk from the terminal. The journey to the main train station, where you can transfer to the metro system, takes 35 minutes and costs 0.50 Lari, but the timetable is very poor. At the moment there are only two trains during the day, at 08:45 and 18:05. Taxis are just outside the arrival hall and are available 24 hours a day. A taxi ride to the city centre shouldn’t be more than 20 - 25 Lari. Kutaisi International Airport operates Wizz Air low cost flights from Poland and Ukraine, as well as flights from Moscow, Russia and Minsk, Belarus. The airport is located about 230 km from Tbilisi. The airport is very basic, there is a currency exchange window before the immigration control and an information centre to the right of the Arrivals hall exit. Next to the information there is a Mimino cafe, serving coffee, bear, drinks and simple snacks. On exiting, expect to be surrounded by dozens of drivers touting for buses to any destination around Georgia. There is an official Georgian Bus transfer to Tbilisi, Kutaisi and Batumi - tickets can be found next to the information point. The bus costs 20 Lari (about 10EUR) and a journey takes about four hours. The bus arrives to Pushkin park next to Freedom Square. Buses run according to the flights schedule. Don’t be alarmed if you didn’t change money before immigration, you can pay for a ticket in US dollars or Euros. 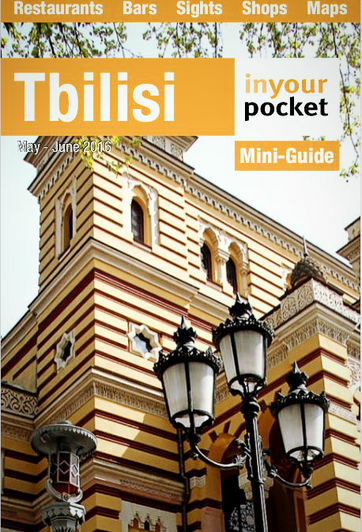 Tbilisi Central Station is located on Vagzlis meidani (Station Square). It was opened in 1872, then demolished twice and finally rehabilitated in 2010. Trains from Yerevan, Armenia and Baku, Azerbaijan as well as domestic trains arrive here. Ticket offices are located on the 1st floor above platforms, at least one service in English, usually located on the right side from the entrance. Timetable is available online at www.railway.ge. Some buses from Yerevan arrive in front of the train station building. Getting to town The best way to get to the centre is to take the metro. The entrance is located just one minute walk away to the right from the main exit of the central station. You can easily get to the city centre or Saburtalo district. It is tricky and a little bit confusing as there are three long distance stations for buses and marshrutkas (minibuses) in the city, and it’s not always obvious which one you arrive to. Just ask the driver which bus station you arrive. For some visitors, driving in Tbilisi can be a daunting experience. On the face of it, Georgians don’t seem the most disciplined motorists. Driving speeds are often fast and lane changes can be erratic. At rush-hour the experience is further intensified by heavy city traffic. The speed limit is 60 km/h in towns and cities. In other areas it’s 80 km/h unless indicated. Highways speed limit is , unless other is indicated on the screens along the road. All road signs and screens are in English. There is a zero tolerance policy towards drink driving and your seat belt must be locked.